Michelle Obama's emotional speech about kidnapped Nigerian Girls gets Mixed Response. More than 200 Girls students were kidnapped from the Government Secondary School in the town of Chibok in Nigeria on 15th April 2014. The kidnappings were claimed by Boko Haram, an Islamic terrorist organization based in northeast Nigeria. Boko Haram opposes Western Education in Nigeria. Amnesty International said that the Nigerian military did not respond after warnings that Boko Haram rebels were about to attack Chibok. Nigerian security forces had four hours of notice before the attack by rebels, but did not react because of fear of engaging the terrorists. Many Countries such as U.S, U.K, China, France, and Spain have offered help to the Nigerian government, after worldwide protests about the lack of action to bring the girls home. Boko Haram's leader threatens to sell the kidnapped girls into slavery. The girls could be forced to marry their abductors or sold to others, for as little as $12. Meanwhile, U.S President Barack Obama's wife Michelle Obama outraged and heart-broken over the kidnapping of the school girls in Nigeria. 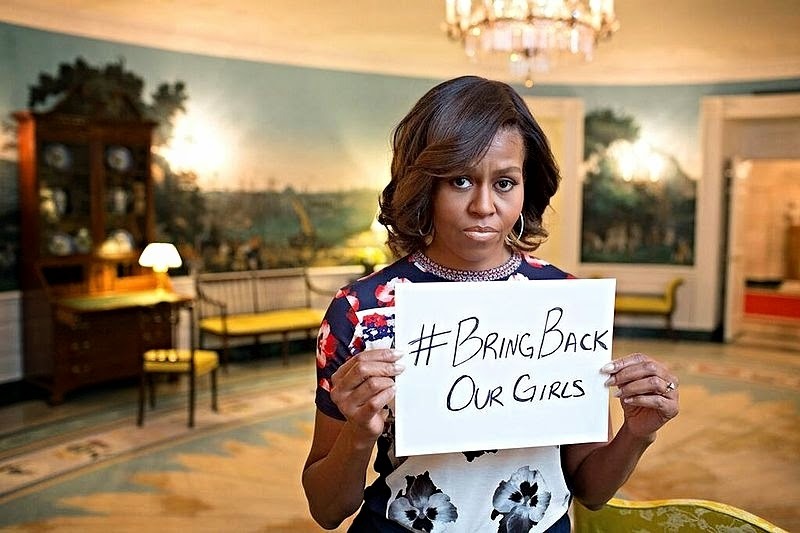 Michelle Obama had posted a picture in which she holds a sign with the #BringBackOurGirls for helping to spread the awareness of the kidnapping through social media. "Like millions of people across the globe, my husband and I are outraged and heartbroken over the kidnapping of more than 200 Nigerian girls from their school dormitory in the middle of the night," Mrs. Obama said in her Mother's Day address. "What happened in Nigeria was not an isolated incident. It's a story we see every day as girls around the world risk their lives to pursue their ambitions," Michelle Obama said in her speech at White House weekly address which will be normally done by Barack Obama. Mrs. Obama praised the Pakistani schoolgirl and education activist Malala Yousafzai, who was shot and wounded by the Taliban for speaking out for girls' education. "The courage and hope embodied by Malala and girls like her around the world should serve as a call to action," Michelle Obama said in her address. And, she quoted the UN Speech of Malal. We can watch her emotional speech in the below video. Michelle's this emotional speech for the kidnapped Nigerian Girls got mixed response in social media. Some people praise the initiatives of Michelle for spreading awareness about this kidnapping, while many people criticizes her for merely talking about this in fact she/Obama can do something solidly for rescuing the girls. Read below snippets of the comments made by the people in various social media sites such as reddit, youtube and imgur about this emotional speech of Michelle Obama. I think it goes without saying that Michelle Obama has immense concern for these girls, but is it wise to use this kidnapping to highlight a perceived prevention of the girls education when it is clear they are the "spoils of war" and in grave danger of losing their lives. She says Boko Haram is against female education, yes they are, but surely this is an excuse to simply rob and pillage local towns to feed their gred and no so called belief system should allow this, it is complete hypocrisy and reffering to Boko Harams anti education agenda voids the simple fact that they are jut murderous thieving liars. To simply emphasize that this is aimed at, snuffing out their education and all they wanted was to take exams & move to next level is missing the immediate concerns for their safety. An opportunity missed. Michelle could have questioned the safety of these girls given the latest concerns that there were sufficient warnings prior to their abduction. It is surely a good ting that these girls beleived in opportunity, but this address is simply a pro female education plea & call to action for education for girls and a suggestion that the youth of America should have an inspiration not to take school for granted and recommit themselves. WHAT!!!! Tell is what is being done to investigate their disappearance and why is it that this plea was not made on 15th April a day after the abductions? 25 days to make a plea for girls to appreciate education? In those days they could be forced into marriage, sold or murdered. She thinks it's her job to be outraged about something and this just happens to be it right now. Heart-broken? I don't think so. She doesn't have what it takes. Funny how nothing was said about how Malala is against Obama's policies on drone strikes, and the young girls who are killed by American military policy. A show of strength and commitment IS what is needed, and this was what Mrs. Obama conveyed. It is what the kidnapped girls themselves stand for. We will find them and bring them back home to safety--that is being pursued already, but the encouragement you presented, in honor of these girls and to strengthen the other Mothers, was very effective, I think. You are truly someone every female can look up to. When our women in life are strong, we are able to make our men and boys feel so much safer, happier and proud. NO ONE should stand in the way of ANYONE'S attempt to enrich or educate themselves for the goal of having--and giving--a better quality of life. My life has been torture. I am a girl. I know how essential having a strong spirit and iron resolve is for staying alive. Our end goal, as women, is to be the best we can be and to SHARE that joy--and the strength that comes from enrichment and education--with all. Education is more than learning wonderful things for a deeper understanding of not only the material and the world. It is also a way to acquire tools to think with. A stronger, quicker brain is a wonderful thing for everyone, wouldn't you agree! Education has some hidden rewards taht are not apparent until you ARE educated. For example, an educated person is less eager to jump to conclusions that are faulty conclusions lacking evidence or information. In this way, one can achieve understanding, which is an incredible stress-reliever, if nothing else!! This is what you are promoting here, and it is indeed an essential ingredient. THERE SHOULD BE NO OPPOSITION or negative opinion with regard to this speech. Someone stated here that Mrs. Obama should express more concern. What are you TALKING ABOUT? Try to think logically. She wouldn't have made the speech if she wasn't concerned; she has DAUGHTERS OF HER OWN, so she will understand more than anyone without children at all--like me. Only a mother can understand this level of pain. But Mother's ALSO KNOW that it is absolutely essential that, during a severe crisis, strength, courage and resolve be SHOWN to that everyone can keep their moral high and really be able to focus on solving the problem: finding their location and returning them to their homes. This commenter seems to think it is Mrs. Obama's job to hunt down the kidnappers personally. Maybe you should. But no, we are leaving that to the MEN and other experts who excel at that specific task. Maintaining resolve and high moral during this critical time is most important. When the girls are found, they will want to know they HAD this kind of support from our country, and from OUR FIRST LADY of the UNITED STATES OF AMERICA. I am so proud to have Mrs. Obama as our first lady. I have gotten a lot out of listening to her and what her focus is. Michelle is just like her husband. All talk, no action. This coming from the woman who just spent 40million to go on yet another vacation while the country struggles with unemployment and the biggest budget deficit ever. Let us not forget that Nigeria is the biggest oil exporter of Africa. What do you think about Michelle's speech? Do you believe that she could do something better than just giving some emotional speech? You can share your thoughts thro' the comments. Military sources have stated that a combined team of security agents in the field and back up communications and satellite imagery specialists have located the missing girls inside the dreaded Sambisa forest.